Event sponsors are often the difference between making revenue and breaking even. But the landscape is changing. Traditional sponsor packages aren’t efficient or intuitive enough to build long-term relationships with high-dollar event sponsors. 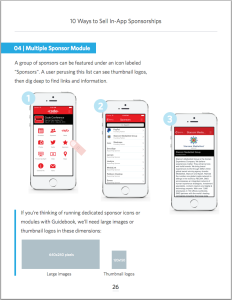 Get the Complete Sponsorship Kit here to learn about how technology is changing your relationship with event sponsors. It’s free, and it’ll put money in your pocket when you’re shaking hands with the sponsor you’ve always wanted. Get the Event Sponsors eBook now! Here’s a breakdown of what’s inside. The relationship you have with your event sponsors and exhibitors is changing. 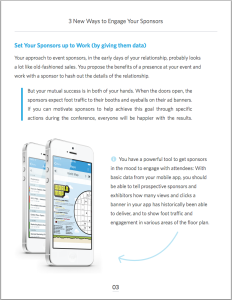 With the now-indispensable mobile apps that help your attendees explore the event, you can deliver compelling, measurable benefits for your sponsors. But you need their help. Helping sponsors understand that they need to engage with attendees, and making it easy, is the key to a warm planner/sponsor relationship. You want to build strong relationships with your sponsors. Promoting attendee-sponsor interaction is the key. Shake up conventional package ideas with these 4 modern offerings that combine digital, analog and… fun! Customization leads to a memorable experience. Learn to promote activity and excitement between sessions with an action package. A QR code scavenger hunt and a sponsored challenge will get their blood pumping! The one with the beer usually has the most friends. 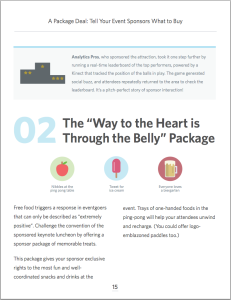 Learn to combine social interaction with free goodies to get attendees to share the event sponsor love! The Bling Package pops with a carefully cultivated combination of branding touchpoints. Your event sponsors will love the attention to detail and their ubiquitous message. This package will tickle a tech-savvy crowd. Clickable mobile banner ads give your event sponsors valuable data, and interactive walls entertain and inform. When attendees’ brains (and devices) are dead, wow them with a sponsored charging valet. Coming back event after event with creative event sponsor packages that facilitate interaction and conversation… that’s how you build lifetime relationships. Let’s get down to business. You want to generate revenue with your mobile event app. Mobile sponsor ads are dynamic, measurable, and easily editable for last-minute strategy tweaks. Learn the best practices and specs for sponsor banner ads, customized event app branding, sponsored event sessions, featured listings, games and more.